Can Someone “Convert” to Islam? In past posts, Reem and I have discussed men and women who have embraced Islam later on in their lives. As I mentioned in a recent piece, by some estimates, as many as one fourth of all Muslim Americans identify as Muslims not by birth. This awkward word arrangement, “Muslims not by birth” is usually shortened to “convert,” however not everyone agrees. Others prefer to use the word “revert.” Depending on whom you ask and what you’re looking to find out, one word may be more useful than the other. And especially since spirituality, religion, and identity are some of the most intimate of topics, you may even offend someone if you don’t ask which terminology they prefer. 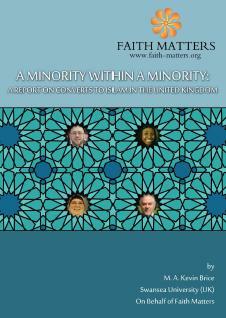 This past January, I wrote about a study put out by Kevin Brice called “A Minority Within a Minority” which documented the rising number of British reverts over the past 10 years. (In Islam everyone is believed to be born Muslim, so when they begin practicing the faith later in their life, they are seen as returning or “reverting” to their original state.) According to Brice, the average revert is a 27-year-old women. An article in The Independent appeared at the beginning of November that highlighted not only the numbers of British reverts but also the obstacles that they face. On the next Inside Islam radio show, this Wednesday, December 15th, Jean will be talking with G. Willow Wilson, the author of The Butterfly Mosque: A Young Woman’s Journey to Love and Islam. In her memoir, Wilson tells the story of how she came to Islam and how she met her husband Omar. Why Are Black People Converting?